Open up to an hour before the park closure. The area is not guarded and closes 30 minutes after the park. The cost is 3 euros and you can pay directly to the ticket office. For motorcycles, motor homes and disabled people parking is free. The park is designed to allow disabled people and strollers an easy access. If necessary, you can take off and return to the park. It is necessary to contact the ticketing staff to report the momentary exit. For reasons of hygiene and veterinarians, animals can not be introduced into the park. There is a convention with the Mein Staffi dog pension, just a few steps from the park, more info at the ticket office. Dogs guide: access is allowed, excluding the Madagascar and Petra Amphitheater. For authorization and further information, contact the ticket office. It is forbidden to bring bicycles, scooters, skateboards, rollerblades or rollerskates into the park. The only exception are balance bikes and scooters for the exclusive use of children under the age of 3. It is possible to leave bicycles at the equipped area behind the ticket office. It is forbidden to bring balls, balloons, etc inside the park. Visitors are allowed to take photos and videos for private use only. For intended commercial use, it is necessary to contact the Marketing Department. Entering the park, visitors implicitly accept that they can be photographed and videotaped by other visitors and park staff. It is forbidden to turn on fires in the park. For safety reasons it is forbidden to introduce glass objects into the park. All talks, meetings with biologists, are free and included in the ticket. For security reasons, access to the Petra Amphitheater, Hippo Underwater Arena, and Madagascar Island is only allowed until capacity is exhausted. Swimming pools can only be accessed with the Park + Swimming pools Combo ticket by wearing the bracelet delivered at the entrance. Park ticket holders can either upgrade online or directly to the park. 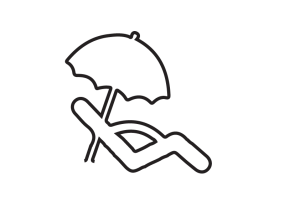 Beach umbrellas and beach loungers are bookable online or directly at the park, subject to availability.